the main ingredient (banana) is barely noticeable when you bite into it. That's kind of like eating a peach cobbler and not tasting the peaches! For banana bread, the bananas have to be the hero! They explain that the trick for banana bread is to use ripened bananas. 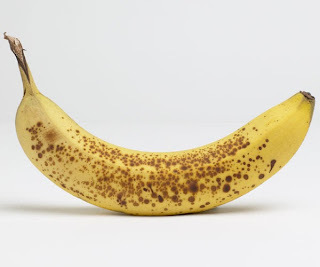 When I was a kid, I've always liked the taste of a bruised and freckled banana (Exhibit A) instead of a bright yellow one (Exhibit B). These are the bananas that are perfect for banana bread because the banana flavor really comes through when they are ripe. You would think that the concept of using ripe bananas is obvious, but no it isn't. Why you ask? Because some people don't like seeing freckles and bruises on their bananas. 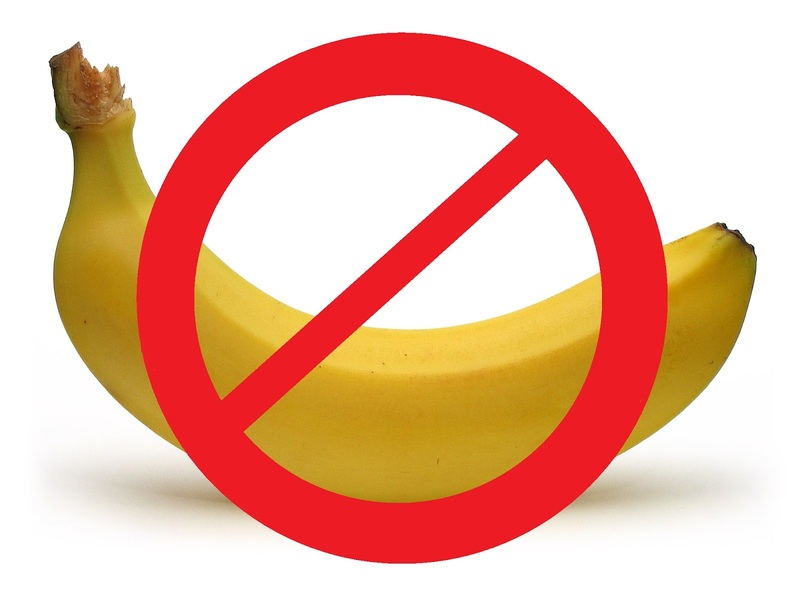 These flavor-challenged folks see these blemishes and think that the fruit is rotten, but that certainly isn't the case with bananas like it is with other fruits. They just don't like the concept of eating a banana that isn't pristine and perfectly yellow even though the patches of black is an indication that the banana itself is ripe. When a banana is ripe, the starches turn into sugars making for a better tasting banana and, hence, a better tasting banana bread. In the following episode (season 11, episode 8: Coffee Break Sweets), ATK Chef Julia Collin Davison shows us how to use ripe bananas so that our banana bread can taste like banana. It goes to show that making the ultimate banana bread that actually tastes like banana doesn't have to be difficult at all. 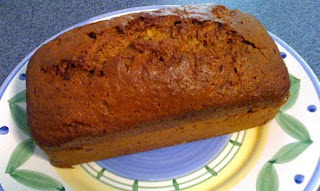 I've had some banana breads that were overly dense, but this banana bread is nice and light and not to mention moist and delicious. You can, of course, change it around a bit. I went to one picnic where someone brought a homemade loaf of banana bread and she added melted chocolate to the batter so that when you slice yourself a piece, the slice looked marbled. It was pretty cool to see a marbled banana bread, and the chocolate didn't make it overly sweet either...more like a subtle chocolate flavor in each slice that complemented the banana flavor. Now if there were only a gluten free banana bread, I'll be all over that. Even though it's optional, definitely use the chopped walnuts. It gives a bit more texture since the crunch from the walnuts contrasts from the light chewy interior. 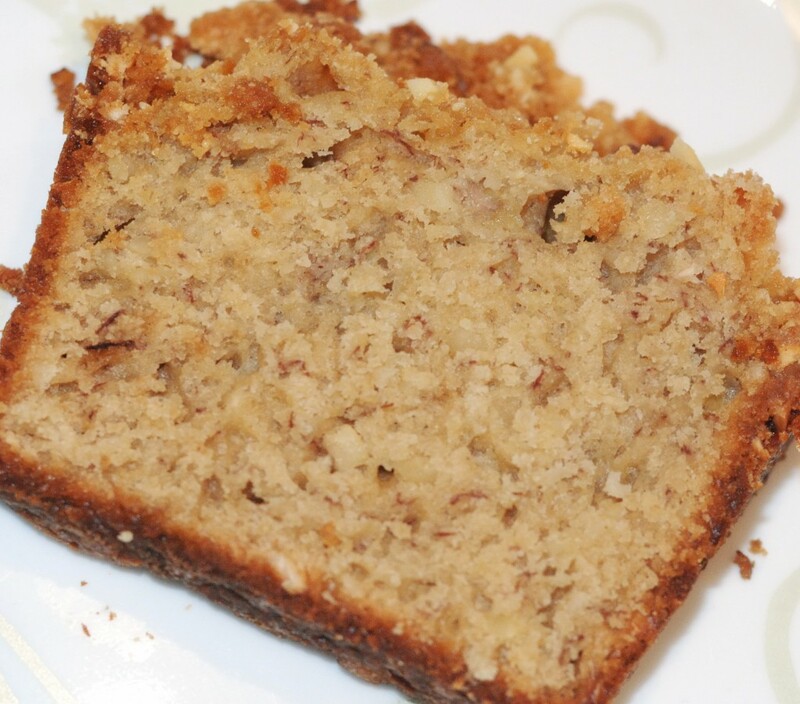 Adding the chopped walnuts changes this Ultimate Banana Bread into the Ultimate Banana Nut Bread. I just did not toast them just to save myself from doing an extra step. Untoasted walnuts is good enough for me. I excluded the fresh banana slices and sugar topping. Let's just keep it simple and not get too fancy here. Save yourself some time and energy by skipping the topping. The banana bread is perfectly fine without it. 1. Adjust oven rack to middle position and set oven to 350 degrees. Spray 8½ by 4½-inch loaf pan with nonstick cooking spray. Whisk flour, salt, and baking soda together in large bowl. 2. Place 5 bananas in microwave-safe bowl; cover with plastic wrap and cut several steam vents in plastic with paring knife. Microwave on high power until bananas are soft and have released liquid, about 5 minutes. Transfer bananas to fine-mesh strainer placed over medium bowl and allow to drain, stirring occasionally, 15 minutes (you should have ½ to ¾ cup liquid). 3. Transfer liquid to medium saucepan and cook over medium-high heat until reduced to ¼ cup, about 5 minutes. Remove pan from heat, stir reduced liquid into bananas, and mash with potato masher until fairly smooth. Whisk in eggs, butter, brown sugar, and vanilla. 4. Pour banana mixture into flour mixture and stir until just combined with some streaks of flour remaining. Gently fold in walnuts (optional) [do NOT exclude the walnuts - they're great for banana nut bread]. Scrape batter into prepared pan. 6. Bake until toothpick inserted in center of loaf comes out clean, 55 to 75 minutes. Cool bread in pan on wire rack 15 minutes, then remove loaf from pan and continue to cool on wire rack. Serve warm or at room temperature. Best banana bread recipe I've tried yet!!! If I wanted to make these in muffin or cupcake form how long would I bake them for? I have a better chance of my son trying them if they're muffin or cupcake form! Hello @Cheryl, I've never actually made this banana bread in muffin form, but I think that'd be a fun thing to do with this recipe. As far as how long to bake them, I would start by baking them for 20 minutes and the go from there to see if that's too little or too much time in the oven. The reason being that individual muffins are significantly smaller than a whole loaf of banana bread, so they'll bake faster in the oven and will take less time. You'll still be doing the toothpick test and seeing if it comes out clean to determine whether they're fully baked. Another suggestion is that you'll be baking a batch of muffins from this one recipe. What you can do is use half of the banana bread batter to make the first batch of muffins (say 1 tray of 2x3 muffins) for a certain amount of time. If they seem overcooked, you can use the rest of the batter for a 2nd tray of 2x3 muffins and put them in the oven for say 5 minutes less or 5 minutes more if the first batch was undercooked. Whatever you do, you'll probably need to keep an eye on the muffins and note the amount of time needed for them to fully bake. Everyone's oven is different, so I hope this helps and good luck! Let us know how it went. Hi @Anonymous, thank you for that great tip! It's common for grocery stores and supermarkets to remove the spotted bananas from the display shelf to make room for the new stock of unripened, yellow bananas. Yes, you're correct that it wouldn't hurt to ask if they have the older bananas available in the stockroom. They may even sell the older, spotted ones at a discount or perhaps even offer it for free since more likely than not, they were probably going to get rid of them anyway. Thank you so much for posting this. ATK always has great recipes - I have purchased their magazines for years. They repeat the recipes on their website but block access even to magazine subscribers wanting an additional subscription. Plus they don't publish an index of their magazine recipes. I would have taken hours to find this recipe in my collection. Appreciate your comments and sharing. Think I'll leave off hte topping too. Hi @smilton, I agree that America's Test Kitchen has a lot of really good recipes. A lot of times they make several variations of the same recipe that you don't know which one to go with since they're all very similar. I'm glad that you're able to use the America's Test Kitchen recipe and video for Ultimate Banana Bread. I hope your banana bread turns out well and Happy Thanksgiving! The. Best. EVER. Only made as muffins, never as a loaf. Insanely good - the texture is amazing (good chew). Skipped the walnuts, skipped the garnish, but always use the sugar sprinkle. Love ATK!! Hello @Anonymous, I'm glad to hear that the America's Test Kitchen recipe for the Ultimate Banana Bread is working out for you. It's definitely my "go to" recipe for banana bread that I don't bother with other recipes. What can you do if you don't have a microwave? Hello @Anonymous, I've never actually done this, but I suppose you could use a toaster oven (or even a regular oven) to warm up the bananas in order to make the recipe for America's Test Kitchen Ultimate Banana Bread. Keep in mind that it may take a bit longer though and you may have to keep an eye on it to keep it from burning. You could try wrapping it in foil or even use a lower temperature setting. These are all just ideas that haven't been tested, so just be careful and hopefully it'll work. Good luck! Hello, I have two questions. 1. Can I use over ripe bananas ( turned black) and can I use a glass baking pan and if so would it have to bake longer or less time at the temp. Thank you. Hi @Unknown, I actually prefer using over ripened bananas both to eat and for baking. If the banana peel was black, but the actual banana is still yellow, that'd be perfect. If the banana itself is black, then I wouldn't use it. I've never used a glass baking pan to make banana bread, but I don't see why not. Is it like one of those Pyrex casserole pans that you would normally bake brownies or lasagna in? If so, I would imagine that it might bake faster due to the different dimensions of the pan. There's more surface area which would mean less time. That's what's great about cooking and baking. There are no rules, so you could just try it and see how it turns out. Good luck!